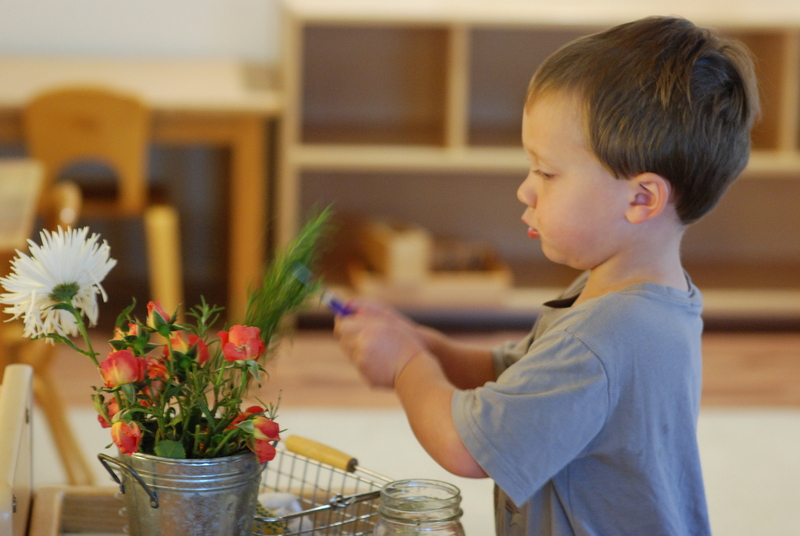 Montessori Practical Life 101 invariably includes the outline for FLOWER ARRANGING. 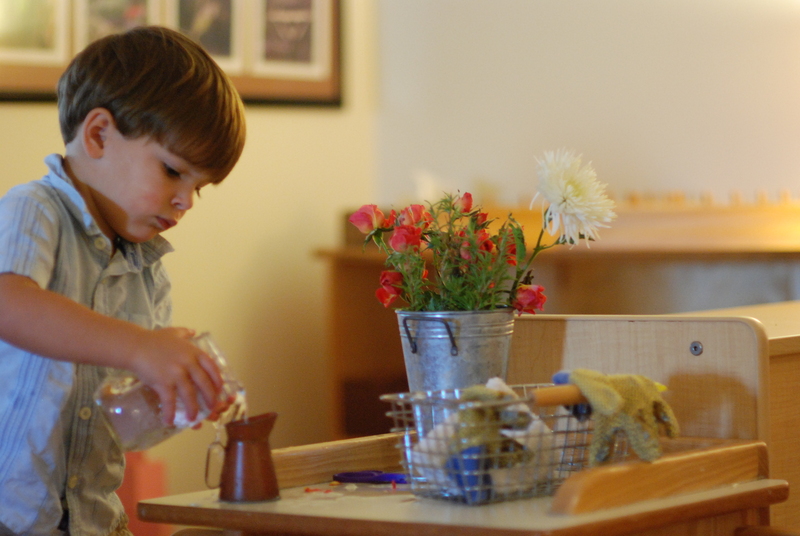 This pivotal work links all cornerstones of the Montessori environment from toddlerhood through elementary- first as a sensorial experience and, later as an in-depth research into the functions and parts of flowers themselves. The appeal of the arranging and the giving of flowers is universal- for centuries flowers have marked important milestones in our daily lives; expressed feelings of love, gratitude or sadness; or been admired as an appreciation for natural beauty. The process of flower arranging is predictably sequenced with precision and care- as are all of the practical life activities- to best support the development of coordination, concentration, order and independence. The child puts on an apron, selects a vase, fills it with water and chooses the perfect flower to cut and place inside the vase. He then carries the vase and a small doily to a table in the room and lays down the vase carefully on the top corner of the table. There is often another child at work sitting there at the table who looks up. The two make eye contact and exchange a moment of silence. 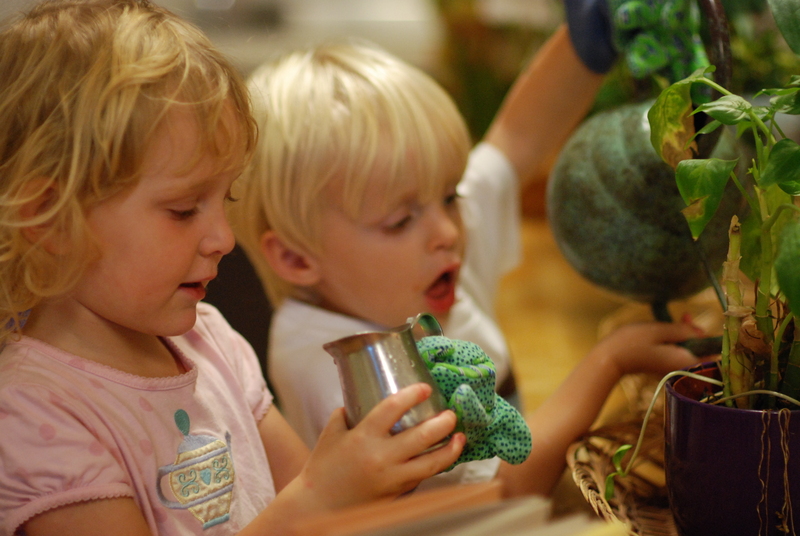 Montessori Guides revel in the work’s ability to assist the child in control of movement, eye-hand coordination, and strengthening hand muscles. The lesson also opens the door for extensions: labeling parts, estimating days of survival, dissecting ovaries, or integrating composting. Flowers are a fragrant, colorful, and fragile enticement to insects and birds. After all, this is how the process of pollination continues. It’s easy to see how flowers lure children of all temperaments to come near and investigate their beauty by looking, touching and smelling. But the flower arranging work has a more important indirect aim than simply admiring nature’s work of art. It is an opportunity for little hands to contribute to the beautification of the environment. It is a tender moment when a young heart lays down a symbol of friendship, love and peace on a table for someone else to enjoy. It is a brief yet integral step outside of oneself and one’s own needs. Flower Arranging provides the mechanism from which the children in the classroom express their empathy and love for their community and its members. I smelt the violets in her hand and asked, half in words,half in signs, a question which meant “Is love the sweetness of flowers? We can build a different infrastructure- one that supports families, early childhood professionals, and child. One that is seeped in fond memories, play, intimate and enduring relationships, and learning across all developmental planes. One with the child centered.